Tampa is situated on the Central west coast of Florida and is more commonly known as Tampa Bay as the Gulf of Mexico flows into the bay at Tampa. 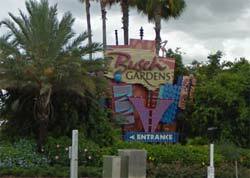 Busch Gardens where you can experience up close encounters with amazing animals, take an unforgettable safari across the Serengeti Plains, test your courage on pulse pounding roller coasters or take in a stage show. As well as the Florida Aquarium where you and your family can enjoy plenty of fun activities like Swim with the Fishes, Penguins: Backstage Pass and a Wild Dolphin Ecotour. And for sports fans why not try Tampa Bay Buccaneers Tampa's very own NFL football team. MyDreamFlorida.com is not affiliated with, maintained by, or in any way officially connected with any Company shown on these pages. 2001 - 2013 © Copyright MyDreamFlorida. All rights reserved.